He was too weak to stand. But no one has ever stood taller. By the time Corporal Mitchell Red Cloud, Jr. wrapped his arm around a tree so he could remain upright, he’d already been shot eight times. 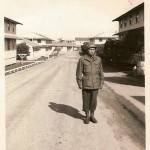 The Korean War was in its early stages. 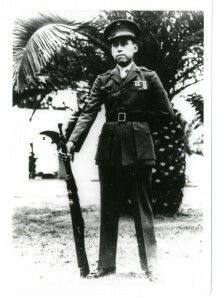 Red Cloud, a member of the Ho-Chunk Nation from Hatfield, Wisconsin, had been manning a hilltop observation post on the night of November 5, when he spotted 1,000 Chinese infantrymen quietly moving into position for an attack on his unit, E Company of the 19th Infantry Regiment. At 3:20 AM, under the light of a full moon, the Chinese troops launched their assault. As the enemy charged from a brush-covered area less than 100 feet from him, Red Cloud sounded the alarm to his fellow soldiers and immediately grabbed his Browning Automatic Rifle (BAR). Jumping up from his hiding place, he emptied magazine after magazine into the charging Chinese forces at point-blank range. The accuracy and intensity of his attack took the enemy by surprise, but they returned fire. Two bullets in his chest barely slowed him down as he continued to fight, but eventually he incurred several other serious injuries. 2nd Platoon Medic Perry Woodley rushed to Red Cloud’s position to apply field dressings to his wounds, but Red Cloud refused his help. As he moved off to treat other soldiers, he heard the bark of the BAR resume as Red Cloud continued to engage the enemy. Hit by more enemy fire, and severely weakened by blood loss, Red Cloud refused to leave his post. Instead, he pulled himself to his feet, used the tree to prop himself up, and continued fighting until one final Chinese bullet ended his life. 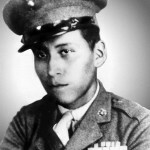 When Red Cloud’s body was recovered the next day, he was surrounded by dead enemy soldiers. His fearless and selfless actions saved the lives of many Americans that day, and his bravery was recognized with a posthumous Congressional Medal of Honor.